Every day, I write a haiku and publish it via social media. Every day, I physically inscribe that same haiku on a single postcard and mail it to someone in the world. Today, that someone is you. This project began on March 1, 2012 and completed on November 26, 2014 when I sent out the 1,001st postcard. Did you get a postcard from me? Cool. I’d love to know your reaction. The Daily Haiku Actual Postcard began as a confluence of two ideas: The Rumpus’s Letters in the Mail , which reminded me that in this day of electronic, virtual communication, it’s extra sweet to get something interesting in your mailbox; Pam Benjamin, who reminded me (actually, she passionately insisted) that a poem written on a piece of physical paper constitutes a unique, and therefore worthy of love, artifact. I cross-posted the haiku and their photos to Facebook, Tumblr, Pinterest, and other places I have forgotten because it’s all so automatic these days. This blog will shortly morph into an archive for the project. Great idea! Do you mail them to people you know, or to random people from a phonebook? I love this idea so much. If you ever want to do a book of your Haiku adventure I will illustrate it for you. I would be honored. No idea where to begin. Maybe time will tell? Thank you! What a nice surprise to be found in a green mailbox – taken inside to a tiny wooden red house far north. My dog on the couch, snout perched toward the window, waits for the sunrise. Thanks, Anna! Although that haiku postcard was addressed someone not named Anna. Glad you enjoyed it no matter what. I received your postcard Haiku! Thank you so much for sending me such a lovely Haiku. This is a great project and the postcard looks real neat! Thank you very much for my postcard which arrived this morning. Fabulous. I will take a picture of it against the backdrop of the Rhondda (UK) and email you the result. Your haiku comes to me every morning as I do freewriting before work. Or If I am on the early shift then as I am on the bus into work. Keep up the amazing writing. Benjamin (Graphite Bunny). I’m so glad it made it all the way across the pond. I look forward to the photo! What people say here is interesting and true. I have another chapter in my personal Haiku story. Anyway, it’s true. There is a bit more than a a random ‘project’ now. it’s organic, and has grown into something your never expected. What a wonderful thing to do. Have you heard of etegami? The premise behind the watercolor of an object is to sent that postcard on, you don’t keep it. Wonderful concept. Thank you very much for sharing. I just signed up today and will spend some time reading. Thanks, Michelle. 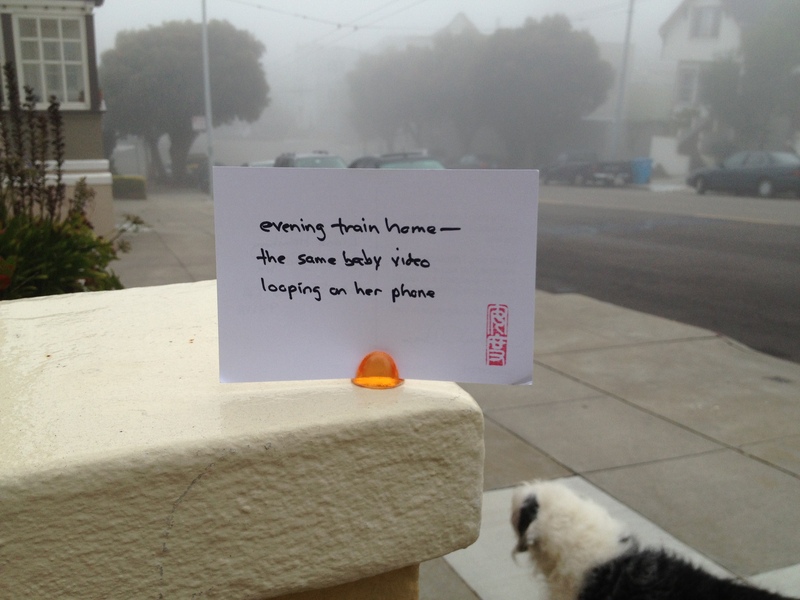 After all is written and photographed and posted, I mail the haiku postcard to someone selected at random. If you want your name in the hat, send me your address. Thank you for your consideration, throw me into that hat please 🙂 I would be thrilled. Done! You’re in the hat! Thanks again for your encouragement. I will delete your response so your address is not there for all the world to see! This is awesome. I love getting mail, but I must confess I love the idea of some stranger finding a haiku in their mailbox. How do I get involved? If you want to send a card, you’re on your own! Just arrived. So delighted as it was one of my favorite ones this past week. Made my day, my friend! I’m glad it made it to you. Thanks for participating! Pingback: WHERE IN THE WORLD IS HAIKU ANDY ? — 12262014 | Randa Lane - Haiku and More! And, if you’re sending these post cards to random people, do you leave an address or a way behind on your post cards for people to give you feedback? Wonderful concept, I’m glad I took the time to discover and explore your blog. Thanks! It’s very gratifying to know you enjoy my work. The project was very rewarding. The last postcard was sent on November 26 of this year. That was the 1,001st postcard and it seemed like a good place to wrap it up. Yes, my haiku postcards found their way to many countries around the world, including Germany, England, Ireland, Greece, France, Italy, Sweden, and Norway. The postcards included the web site (haikuandy.com) and many people did reply back. Some even sent photos of themselves holding the postcards.